Inspired from a broad range of artistic, cinematic, philosophical, and musical sources How To Dress Well, aka Tom Krell, creates music that is provocative and compelling. Though the arrangements are remarkable, it is Krell’s singing voice that truly carries this record. Experience his brilliant vocals as he headlines the Echo on Saturday, June 16, 2012 with special guests Babe Rainbow and The Holloys getting things popping off for the night’s musical festivities. Tickets to the show are $12 in advance and $14 day of show. This show starts at 6 p.m. and is 21+. Enter the contest below for a chance to win a pair of tickets! You must have a Twitter or Facebook to enter the contest. First make sure you’re following Grimy Goods on Twitter here and/or “like” our Facebook page here. We’ll pick winners on Thursday, June 14. The winners will be direct messaged on Twitter or contacted below their contest entry comment on the Grimy Goods Facebook page. Winners will have until 10 a.m. on Friday, June 15 to claim their win or the tickets will be forfeited. To increase your chances, enter the contest both ways! Via Twitter: Send a Tweet to @GrimyGoods, and tells us why we should hook you up with tickets! 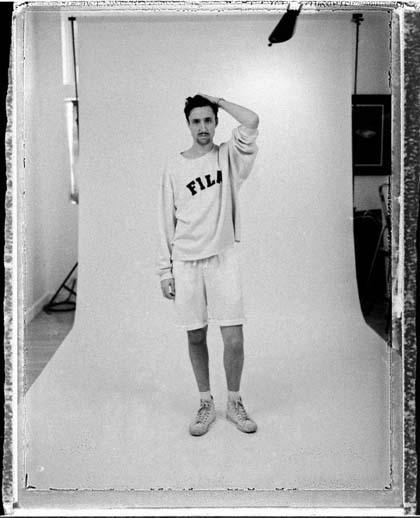 Mention “@HowToDressWell at @TheEchoLA and be sure use the following hashtag: #ContestDressWell. Via Facebook: Just leave a comment on the Grimy Goods Facebook page telling us why we should hook you up with tickets! Be sure to mention How To Dress Well at the Echo so we know which contest you’re entering! This entry was posted in Giveaways and tagged Babe Rainbow, concerts, Giveaways, Holloys, how to dress well, The Echo, tom krell on June 12, 2012 by Sandra Burciaga Olinger.